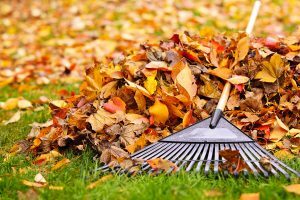 Leaves are falling, the evenings are getting cool, and you’re probably aiming to get a weekend of raking and tidying to prepare your yard and vinyl deck for fall and winter weather. So where should you start? Tuff Industries has a few suggestions on vinyl deck, yard, and garden tasks you might want to consider to prepare everything this fall. Now is the time to get your lawn prepared for winter, and to reduce the amount of work you’ll need to complete in the spring. Trees can use a deep root fertilization as well to help set them up for a successful next year. Even though it’s cooler, unless it’s raining regularly in your area you’ll still want to water your yard and plants so they can have healthy roots for healthy growth in the spring. However, you should consider switching your watering schedule to early mornings – overnight, wet lawns can be damaged by frost and may begin growing mushrooms and other fungi. While you likely raised your mower deck in the summer to conserve water and keep your lawn green, it’s a good time to lower it now. Cutting your lawn shorter in the fall will prevent the grass from becoming flattened under heavy snow. Now is a good time to dethatch your lawn – remove excess dead grass surrounding the base of your lawn if there is a significant amount. Aerating is a good idea as well if your lawn is quite dense to improve irrigation. It can be tempting to leave weeds to die over the winter, but if you do they might have a chance to spread underground before the temperature drops, making more of a challenge in the spring. You might want to add some mulch as well to inhibit weed growth and help your flower gardens and shrubs look tidy. Everyone’s favorite activity! If raking the lawn is your ideal afternoon activity, consider buying a mulching blade for your mower. It will dice up leaves and they can compost over the fall to add more nutrients to the soil in the spring. Note that you don’t want to leave a thick layer behind – this will simply help mushrooms grow. Before winter, start by thinning out perennials to give them room to “breathe” – you can also move these plants to a new location to spread your garden out. If things are looking a bit sparse invest in a few more perennials (or find a friend who is thinning out their garden and get some freebies). Finally, end your fall cleaning spree by taking care of your vinyl deck/patio. Sweep and rinse the vinyl deck membrane, and put furniture away. Clear a space to ensure easy passage to your yard/home and to make shoveling easier, if it is needed. A few minutes spent now will save a ton of work in the spring. If you happen to notice any issues with your vinyl deck, patio, or vinyl membrane while you are cleaning up feel free to contact a Tufdek™ qualified contractor to have a look.